Rained like it was Miami on Tuesday. Lowered the heat and humidity for the last two days so it is really beautiful and the grass is greening up a shade from the edgy brown that it promised to evolve to. The monarda I put in is flourishing--and the deer pests are not interested. Promising. Plans afoot to try something new. I have a bunch of holiday illustrations (many of them rejects from client's wishes and desires)--and think that I should call up the ispot and get them up in the next week. Afterall, it is holiday time for those in retail etc. Christmas has to be done and printed by the end of August to roll into fall with all of that behind them so the addressing and stamping can be done in a timely (not a screaming rush) manner. I'll post a link when it all happens. Gotta get a bunch of supplies and stuff for K's attending NYSSSA's visual art program. Also am curious about the edited thesis. I would love to have it in my hands before July 1. I think I better start pushing on when when when. R back from the world travels with a memory stick filled with evocative images of simple, perfect, antique dressed stone walls, simple monastic environments as perfect environments for design work, indoor/outdoor spaces; and tales of elegant parties, interesting people, cheese shops, good design and "art" ("strings with a stone attached for three million dollars"). He is in good shape and is filled with ideas and talk. Should be fun getting more of the data dump we will get over the course of the next month or so. 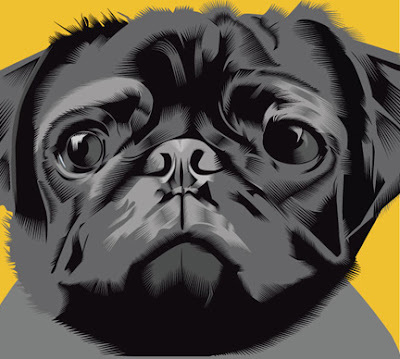 Pug part of a new illo on the board.